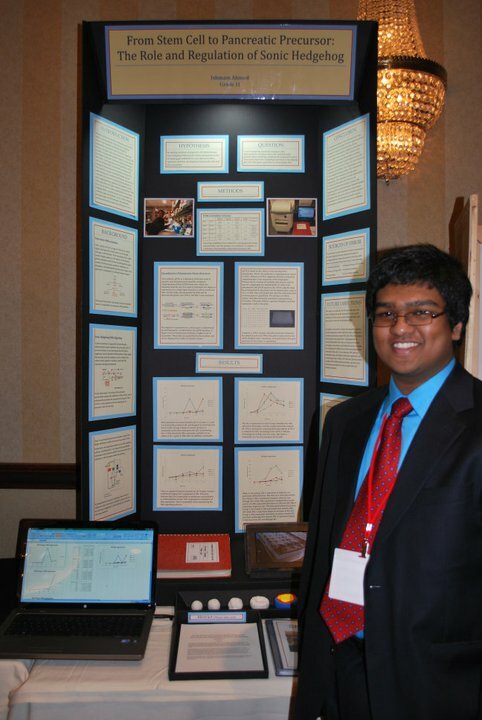 The Minnesota Academy of Science state science fair began this week. Those of us that moved on from the Twin Cities Regional competition found higher stakes and an even more professional atmosphere. The science was impressive. I arrived at the Sheraton half an hour late. Luckily, the frenzied atmosphere was good cover and I was able to check into my room and set up my poster without making my tardiness apparent. By the afternoon, I had passed safety inspection and had the remainder of the day to myself. Station e-27 was ready to go. We listened to a commencement speech, ate dinner, and us our group succumbed to StarCraft. I spent the latter part of that Sunday night catching up on US History readings. By 9am the following morning, I was awake and ready. The projects were set up in a brilliant ballroom and each one shone with it’s individuality. The ones along the wall were the most spectacular, lit up thanks to their special with-electricity spots. The judges asked challenging questions and were very amicable. They treated us like real scientists, rather than just a bunch of crazy kids with backyard projects. I’ll be honest, it was a feeling was appreciated as much as it took getting used to. My project was significantly revamped from the regional fair. Although the content and data remained the same, I changed the context of my project into one that focused more on the clinical applications and how diabetic patients could benefit. It feels good to see your hard work pay off. By the end of the fair, I got to take home my fair share of accolades. I was really impressed by some of my close friends, who will represent our region at the Intel International Science and Engineering Fair. The real fun took place outside the fair though, with an organized dance and other activities. Needless to say, nobody parties quite like high school scientists. I don’t think anyone ended up getting much sleep that weekend, but I guess that’s the price you pay for a really great experience.